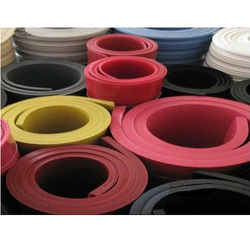 We are a leading Manufacturer & Supplier of Rubber Products such as Rubber Profiles, Nitrile Rubber, Food Grade Rubber Products, Rubber Rods, Rubber Rollers, Rubber Bellow and many more items from India. 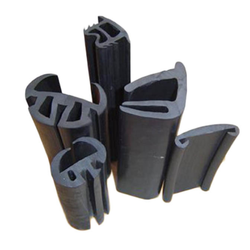 Founded in the year 2006, we have been counted among the most valued manufacturers, suppliers, wholesalers, traders, retailers and exporters of a vast array of Rubber Profiles. These products are manufactured using super quality rubber, which is non-porous in nature. Easy to maintain with water and mild detergent, this range is also ensured for retaining moisture. Clients can avail these products in varied thickness and hardness as per their specific demands. 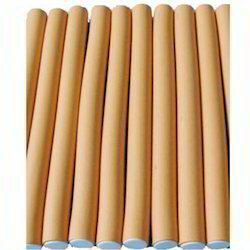 Supported by a team of dexterous professionals, we have been engaged in offering a wide assortment of Rubber Rods. Each rod that we offer is manufactured by our diligent workmen, making use of latest tools and technologically advanced machinery. In addition to this, our offered range is demanded its smooth finishing and dimensional accuracy. 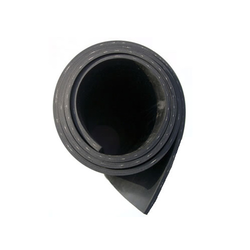 On offer from us is available Rubber Bellow for the clients. The bellows we offer are manufactured using high-grade chemicals, polymers and other materials, obtained from acclaimed vendors of the market. Made in consonance with the international quality regimes, these products are assured for their tough design, high strength and durability. We are a paramount organization, which is actively engaged in manufacturing, wholesaling, retailing and exporting Sponge Rubbers Profile. Manufactured using high quality rubber, these profiles are acclaimed in the market for their abrasion resistance and high tensile strength. Clients can avail these products at market leading prices from us. A synthetic rubber copolymer of acrylonitrile, Nitrile Rubber offered is also known by the name of acrylonitrile butadiene rubber and finds common use in automotive and other similar industry sectors. 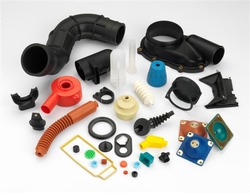 Some of the products the rubber is used for include hoses, seals and grommets. Featuring superior engineering properties, the rubber also provides for superior resistance to mineral oils and greases, fuels like gasoline, diesel; animal and vegetable oils and fats as well as hot water. We can also custom develop it as per the specifications provided by the customers. 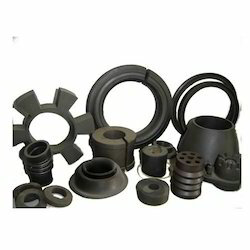 Food Grade Rubber Products offered feature high service life and comes in NBR material finish. 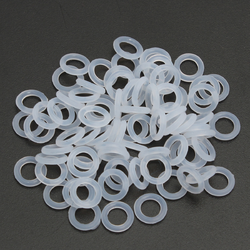 Made available in white and other colour choices, these rubber products find use in general gasket usage in food processing sector/applications. Other than this, it also finds use in cosmetics and pharma sector. We make it available in full roll size as well as in options of trimmed sheets. Some of its features include die cut and rubber moulded FDA rubber products and suitability for use in beverage, dairy and other industries. Fabric Reinforced Rubber offered is made of EPDM rubber and features insert of fibreglass cloth added throughout its thickness which provides rubber superior durable finish and superior usage in hot or cold usage. 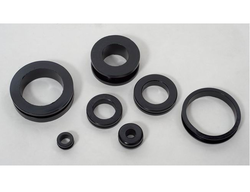 Mainly these type of rubber finds use in gasket making, in conveyor belts, for high strength diaphragm and others. Some of its features include fibreglass cloth insert helps in reducing gasket creep, ideally suited for making gaskets requiring mechanical fastening, resistance to adverse weather conditions, resistance to industrial chemicals, usage suitability for sealing applications and others. Neoprene Washers offeredcan be made available by us in different finish configuration choices so as to perfectly match up with the specific working demands of the customers. Made available in carbon steel and other base material finishes, these washers are designed to effectively handle high loads and durable stable work performance. Some of its features include finding usage suitability in different industry sectors; stable dimension and strong tension finish; used in industries like chemical, petroleum, food industry and others; used in equipment like mechanical sealing, pressure vessel, reaction vessel, heat exchanger and others. Rubber Diaphragm offeredcan be made available by us in different finish configuration choices so as to perfectly match up with the specific process working demands of the customers. 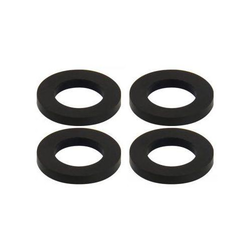 Providing use as rubber seals, these provide support for stopping entry of air, water and dust in machine system and assure of their healthy working. Some of its features include superior chemical and physical properties; high/low temperature-resistance; superior resistance to oil and dust; suitable for use in automobiles, industrial electrical equipment, construction machinery; different material options like NR, NBR, SBR, EPDM and others. Our firm delivers precisely tested and a high-grade assortment of Rubber Strips. It is manufactured using top quality materials and latest technology and tested under various quality parameters. Rubber Packing offeredcan be made available by us in different finish specifications so as to perfectly match up with the specific demands of the customers. Further, the superior braiding finish of these rubber packaging with PTFE graphite yarns as well as silicon rubber core makes these provide for excellent performance. Some of its features include the product having high elastic red silicone rubber core for optimum adsorption of vibrations; support controlling leakage and vibration. Natural Rubber offeredcomes designed and developed using superior construction support. Further, the options offered by us come manufactured using latest wet production technology which safeguards them from possible damages due to shearing and aging as a result of high temperatures. Some of its features include features vulcanization of interior and exterior of thicker rubber; allows users to choose from different colours; OEM construction choices and others. Neoprene Sleeve offeredcan be made available by us in PU/neoprene material finish as well as in OEM size options so as to provide for right end-user support as demanded by the customers. Further, we can also provide these with logo print options to choose from. Some of its features include available in the superior washable finish; provide for the good quality finish; can provide solutions on time and at a competitive price; available in different colour options; superior anti-abrasion and anti-scratch properties among others. 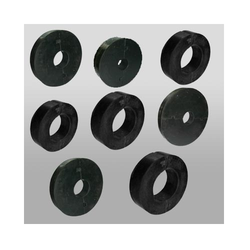 Molded Rubber offered can be made available by us in different finish options comprising NBR, EPDM, SBR, Silicone, Viton and others with hardness properties as well as in other non-standard choices as per client's samples/drawings. Some of its features include having superior acid, high /low-temperature resistance; provide for superior sealing support; suitable for use in areas like electronics, chemicals and other industries; extruding comprising solid/sponge tubes/strips; die-cut parts; superior bonding support and others. 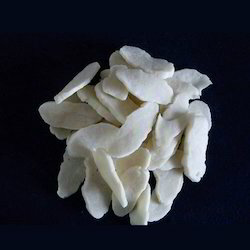 Chloroprene Rubber offeredcomprise polychloroprene rubber with fast high cohesion force as well as adhesion strength so as to match up with the specific demands of the customers. 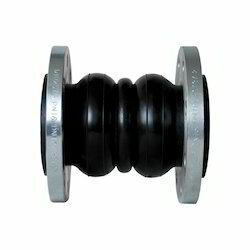 Further, these come with superior heat resistance as well as aging performance and oil resistivity. Some of its features include offering superior flame retardant properties; used for the production of awning cloth, gas bag, flame-retarded cloth. Rubber Strap offeredcan be made available by us in different rubber sizes as well as in material options of natural rubber and other materials as demanded by the customers. 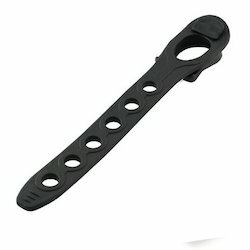 We can offer these with hook support on each end for providing versatile tie down support. Some of its features include suitable for use in light duty applications; can be made available in natural rubber/EPDM rubber; can handle moderate/hot climate due to superior resistance from UV degradation. Rubber Joints offeredcomes designed to provide for light weight and flexible usage as well as are easy to install and maintain. Made available by us in different finish configuration choices, these rubber joints perfectly support the demands of reducing structural noise transmission as well as have strong shock absorption support. Some of its features include suitable for handling horizontal/axial/angular displacement; seamless high-pressure inner rubber joint for preventing the corrosive medium from affecting inner walls; suitability for use in high temperatures; superior resistance from oil, acid and alkali. 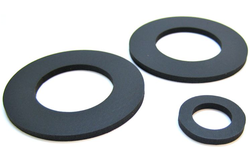 We are engaged in offering our clients a superior quality range of Rubber Gasket. We design the given product following industrial standards by making use of best quality material and modern technology. 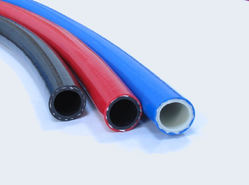 Extruded Rubber Strips offered can be made available by us in different colour options like red, white and other colours as well as in standard and customized finishes so as to perfectly match up with the specific demands of the customers. Further, these provide support as self-adhesive silicone strips and come in parts like self-adhesive tape and silicone foam sponge rubber tape. 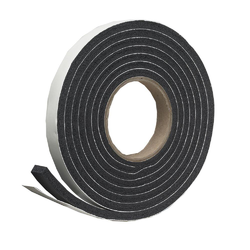 Some of its features include acrylic double-sided adhesive tape; provides for high-temperature resistance; also available in flame retardant series; offering perfect elasticity and high tensile strength. 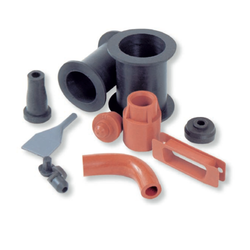 Molded Rubber Products offeredcan be made available by us in different finish material options like NBR, EPDM, Silicone, Viton, PU and others with hardness properties as well as in other non-standard configurations as per client's samples or drawings. Some of its features include have suitable oil, acid and high /low temperature resistance; provide for sound sealing support; suitable for use in areas like electronics, chemicals, food and other sectors; available in antistatic and flame retardant construction; choice of FDA,ROHS compliance; die cutting parts; bonding support of rubber to metal/aluminium options among others. Rubber Pipe Support Rings offeredcan be made available by us in different finish configuration options so as to perfectly match up with the specific process application needs as demanded by the customers. Further, the support rings also come in a quality constructed finish that makes these perfectly suitable for use in conditions needing high oil and temperature resistance. Some of its features include the choice of different sizes & material finish options; accurate dimensions; superior finishing that provides for long service life. Rubber Products offeredcan be made available by us in EPDM and other rubber finishes and can be made available in both standard as well as OEM finish configuration options to pick from. 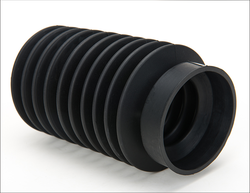 Made available at competitive prices, these rubber products also feature quality construction finish as well as have superior tear, oil and chemical resistance. Some of its other features include good heat resistance; available in different color choices; made available at competitive prices.